Seen on the catwalks of Yves Saint Laurent, Mulberry, Givenchy and Versace, tartan is back and it is THE no. 1 must have for your wardrobe. Violet, mulberry and mauve dominated the runway at Gucci and Elie Saab - it's the perfect colour for those cold winter months. Power to the purple! I absolutely adore this burgundy fringed jacket, it's bold textured look makes it a perfect statement piece to invest in. Wear it with skinny jeans for a glam daytime look or dress it up with a classic LBD and some statement gold jewellery. Whatever you wear it with - you'll be the centre of attention! Metallics here again for winter so dig out your gold, silver and bronze outfits and go from drab to fab in an instant. The metallic trend is just so easy to wear and a great fashion buy because it come back season after season. The great thing about metallic is that it's no longer just a dress it up trend - with items like this sequin tee - daytime casual just got a little bit more glam! So many of catwalks this year rocked amazing oversized outerwear - from Vivienne Westwood right through to Chanel and DKNY. If you want to make your own statement this winter then invest in a giganti-coat! Wear with tights or skinnies to avoid looking heavier. The great thing about this seasons trends are that they are all really wearable for everyone. From metallic and sequin tops right through to mulberry coloured basics. There's so much to choose from - now go - wear the trends people! 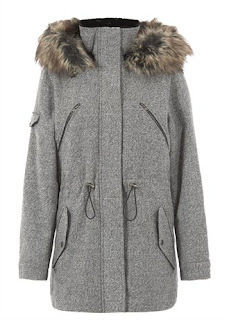 But don't get the Zara Coat - 'cause I want that one!